WhatsApp is the world's number instant chat messaging app available for almost every smartphone today. WhatsApp currently has a user base of 1.2 billion as of 2017. These users share 4.5 billion photos/images on WhatsApp per day (not every user shares photos on a daily basis, still the figures are huge). Besides receiving 4.5 billion photos every day (which is around 4.5 Petabytes, if every single image shared has a size of 1 MB) WhatsApp keeps itself in a 100% running state. If we talk about videos then around 1 billion videos are shared every day. If each video has a size of 16 MB then 1 billion videos will correspond to 16 Petabytes. Combining photos and videos we get 20.5 Petabytes of data (photos and videos) shared on WhatsApp every day. Here we are not including the 55 billion text messages that are also exchanged per day. WhatsApp has set up file size limits which keeps its servers in a 100% working state. You can't share images/photos, videos, and audio files having a size greater than 16 MB. Whenever we share a photo within chats then WhatsApp compresses the photos and reduces their quality and size. Same goes for the videos as you can't send a video greater than 16 MB or up to 2 minutes 50 seconds. So if you are sharing a high-quality photo then it will be automatically compressed to low quality and low size. And if the image contains some text like the photo of your vehicle insurance, office related reports, or any other document then after compression the text will be unreadable/blurred because of low image quality after compression. 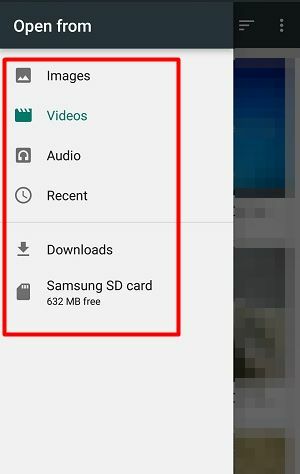 So how can we send photos on WhatsApp without compression and in high and original quality? Is there any solution for this? Yes, it is quite possible we will tell you a trick through which you can share photos, videos, and audio files which are up to 100 MB in size. 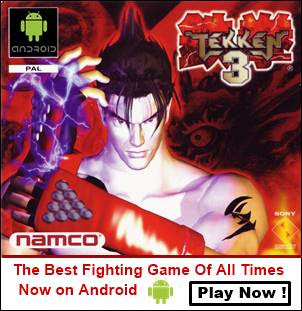 Read the tutorial below. By following this tutorial you will be able to share photos and videos having a size equal to or less than 100 MB. The trick is that we are not going to share photos and videos as media files. We will be sharing them as documents instead, as we can share documents up to 100 MB in size. Open any chat in WhatsApp in which you want to share the image/photo, video, or any audio file. Tap the attachment (paper clip) icon just before the camera icon in the text field and tap 'Document'. A page will open with a list of all the documents stored on your phone's internal storage. Tap 'Browse other docs...' on the top. This will open the android built-in file manager. 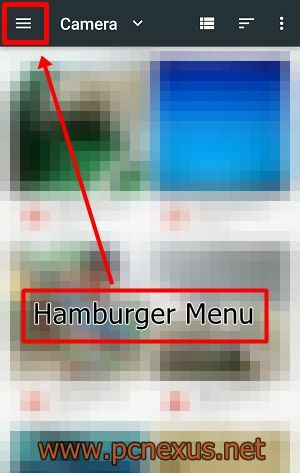 Tap the hamburger menu icon in the top left corner and you will be able to access Image, Videos, and Audio files. It's your duty now to search for the desired photo video. They can be found in the 'Camera' folder. After getting the image tap it. WhatsApp will show you a confirmation dialog before sending that image, video, or audio. Tap 'SEND'. The photo will be sent in its original quality and original resolution without any image compression. 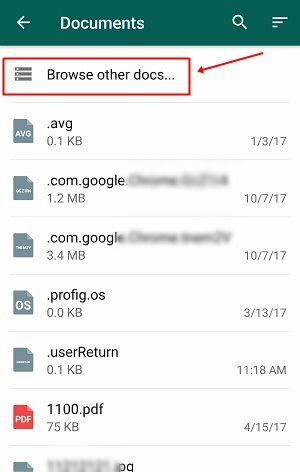 You can check the size by opening that photo in Google photos app and checking its file size. You will see that the images or photos that you just shared/received in full resolution still look blurry, compressed, or of low size and quality when viewed in WhatsApp. There is the following fix for this problem. After downloading the photo go to this directory on your phone's internal storage. 'WhatsApp>Media>WhatsApp Documents'. Use ES file explorer for easily going to this directory. Now locate that photo in the 'Documents' folder and copy it from there and paste it into your phone's internal storage's root directory using ES file explorer. Now you can see that image in Google photos in full resolution and without any quality loss. 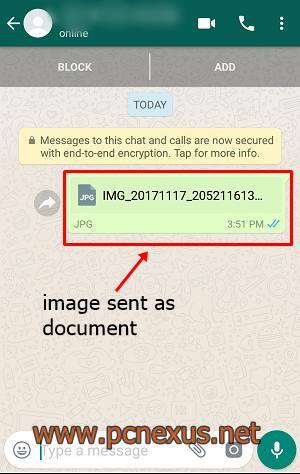 So this is how we send pictures without losing quality on WhatsApp thereby virtually disabling WhatsApp image compression. If you liked the article then please share it.